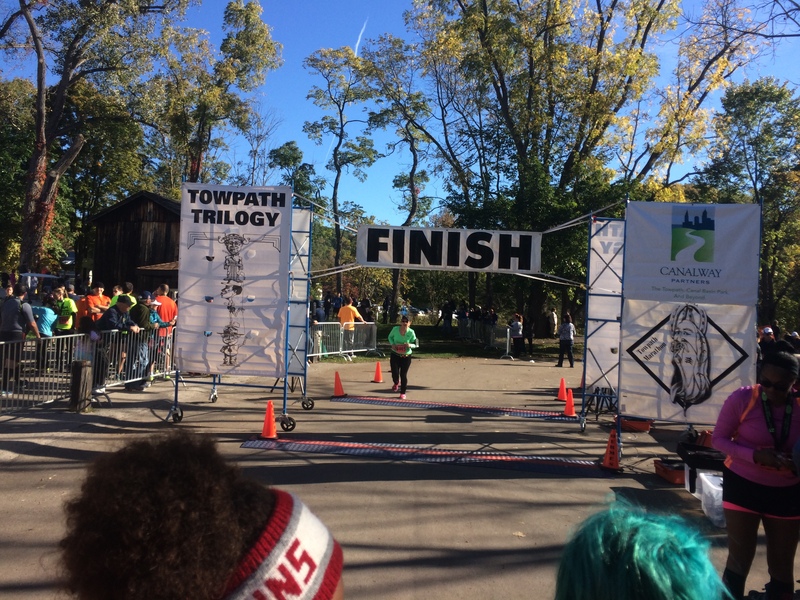 Pretty much any Casual Runner in Northeast Ohio knows about the Towpath Trilogy – a series of races held every year that benefit the Ohio & Erie Canalway, which is a favorite – and absolutely gorgeously scenic – training spot of local Casual Runners. Cuyahoga Valley National Park is one of those local treasures that every community should have and cherish, whether you are a runner or not. 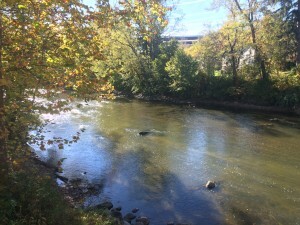 As this race affords Casual Runners the chance to take in the scenic vistas, and is very highly regarded in the regional running community, I wanted to give it a shot and review it for Casual Runner. Also, I ran the 10k in 2012 as my first ever 10k race (following my disastrous first race experience), and so it would be nice to return to try out the half marathon event. This is one of those no fuss/no muss race experiences, which is a good thing because not every race has to be a grand experiment in logistics. For locals, no real travel is required, though I did speak to some Casual Runners who opted to spend the night in nearby hotels to cut down on their driving (i.e. maximize their sleep) on race morning. This race combines the scenic beauty of a National Forest with small town charm. My training lagged somewhat at the beginning of the month as I was doing some non-runcation travelling (yes, even Team Casual Runners are allowed those trips! ), however, I was still maintaining my fitness level from my recent races (the Akron Half Marathon, the Green Cathedral Half Marathon, and the inaugural Rock and Roll Hall of Fame Half Marathon). So I did a 4 mile shakeout run the day before the race and was pretty much ready to go. This event offered quick and easy bib pickup as opposed to a full-on expo. 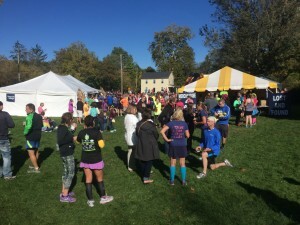 Organizers allowed runners to pick up bibs for friends and family, which continues to be an appreciated feature given the busy schedules Casual Runners tend to keep. Bucking the trend of many races, bib pickup provided lots of freebies for participants, such as band-aids, Hyland’s muscle therapy and leg cramp samples, Meta Health Bars, EmergenC, and even travel deodorant. But my favorite was the trial pack of KT Tape. This is an affordable race by current standards, and as such the official swag consists of a custom Brooks tech shirt featuring the event logo. When I asked my 5 year old nephew what he thought of the shirt, he said it was “stinky.” I presume its because it is a shoe? I cannot say that I am the biggest fan of this logo, but I do appreciate that organizers gave out short sleeve shirts (it seems like there is an unwritten rule that half marathons should only give out long sleeved shirts, and I really do prefer short sleeves, but maybe its just me?). 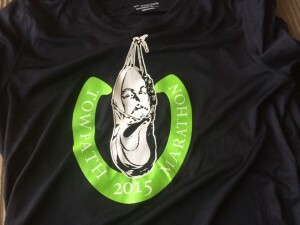 The event shirt and custom event logo. Despite the cool autumn temps, I represented in my Team Casual Runner running singlet. The rest of my race kit consisted of Layer 8 running shorts, Adidas Climalite compression shorts, Steigen running socks, a Sweatvac hat, Sqoosh sport bands, Soleus GPS+ watch, and Saucony Virrata running shoes. I also had my Iphone 5S, Yurbud Ironman Series headphones, and a Ziploc bag for moisture protection. I applied a generous amount of Body Glide to prevent chafing, but just not in all of the right areas…uh oh. We actually caught a huge break. My phone apps told me that race day temps would be in the low 40s, but they turned out to be in the low 50s instead. Yes, a little crisp, but overall this makes for great racing weather, especially on a clear autumn morning in Northeast Ohio. We arrived at the Brandywine Ski Area where parking proved to be ample. Traffic was heavy leading to the parking lots, but the traffic control did a great job of keeping it moving. Also, it turned out that I parked 20 feet from the starting line. I will NEVER ever get this lucky again, but it totally made my morning and we were able to camp out in the car and stay warm until just minutes before the start. There are 3 events: the 10k, half marathon, and marathon, the latter of which starts from a different location. Unfortunately, a handful of runners were confused by this and went to the wrong start location. Volunteers used bullhorns to make sure everyone was in the right location, which triggered a panicked reaction by these marathoners who sprinted to their cars. Props to race organizers for doing their best to make sure everyone was where they should be. There were plenty of portable bathrooms and the lines moved efficiently and orderly. They also had volunteers handing out water and bananas. The best thing that happened that morning was a good friend, who did not know that I was running the race (I was a last-minute add) saw our posts on social media and got in touch with me so we could run the race together. (See, you really should be following Casual Runner on Facebook, Twitter, Instagram, YouTube, and Google+). This made my day as it was a pleasure to run the race with her. The race begins as a mass start, which was not that big of a deal (despite my usual aversions to mass starts) since the half marathon field was manageable (as I said, the marathon began in a different location and the 10k started after our event), which cut down on the congestion. We started on a slight downhill before making a left turn onto a main road and then a right turn onto the Towpath. Race Icon: Taking in the natural beauty of the National Forest on a gorgeous autumn morning. For those who do not know, the two major selling points of this event are that you get to run in the National Forest (did I mention that it is spectacular?) and you do so on the Towpath that follows the canal way. This makes for a flat, tree-lined course the entire way. Now, one would expect that this would lead to heavy congestion, but, from my perspective, runners were generally courteous of one another and congestion, while noticeable, did not seem to be too bad, at least to me. Participants who chose to run side-by-side with a buddy (like we did), generally had one runner run in the grass along the path, which worked out well. There are parts of the course where, due to construction and the two way traffic of its out-and-back design, runners are encouraged to proceed single file. Because of this, while I describe this as a flat course, I hesitate to declare it a “fast” one. If you fall in line in an area of two way traffic, passing can be difficult and you may be forced to adjust to the pace of traffic. Remember what we always say: Accept. Adjust. Advance. Every runner should know what to expect of race day conditions. This is not a big-crowd race, it is a race where one gets to appreciate natural beauty, and the scenery is in abundance. Race Icon. I could write on forever about how gorgeous the forest is, especially in autumn, but I would recommend you check it out for yourself, the scenery really is spectacular. OK, generally this race gets solid marks for logistics: the course was well-marked, the water stations were sufficiently placed and volunteers did an excellent job of dispensing plentiful fluids and providing on-course directions and warnings, so they deserve our kudos and gratitude. However, there were not any aid stations along the half marathon course. I kept seeing signs that said “aid station ahead,” however I learned that this actually meant “water station,” not a first aid station. I stopped and asked the volunteers for band-aids, but none of them had been supplied with any, which was very disappointing. I consider myself to have been fortunate on this day, as I only experienced mild discomfort, it really was not too bad. 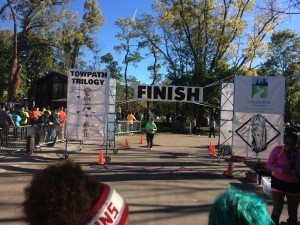 However, as portions of this course are out-and-back, I saw several runners coming in the opposite direction who were suffering from a not insignificant amount of bleeding from chafing. Yes, it was my mistake, and it turned out to be a minimal inconvenience, but I would think that at least one true aid station for minor injuries or problems during a half marathon is warranted. That being said, we did see one runner being evacuated from the course for medical reasons. Thus, the event team proved itself prepared to handle these more important situations. We hope that runner is ok. The finish line amidst the autumn splendor. Magic Moment. As I was in the last mile, I just so happened to see a colleague who was a part of the event team. She yelled and called out my name when she saw me, so naturally I ran to her and we high-fived. These unexpected moments really do bring a smile to your face and an extra pep in your step. With that I proceeded to the finish, which is proceeded by the heaviest crowds of the day cheering runners on. The best part about running a half marathon on a course that shares a finish with the marathon event is that you can use the mile 26 marker to help you pace out the final .2-.3 miles (as opposed to just .1 miles with the 13 mile marker) for a sprint finish. When I saw the mile 26 marker in the distance I pinned my ears back and ran as fast as I could. We made a sharp right onto some grass into the finish area. And with that, a very scenic half marathon was in the books! 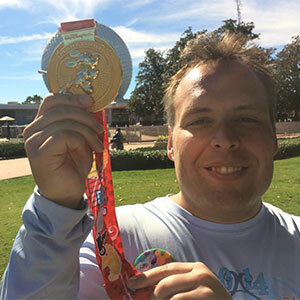 If you are a Casual Runner who runs races for bling, this may not be the race for you. I am not saying that every race has to have the biggest and bestest bling, but, for a half marathon, this SMO is just ok. The 2015 half marathon medal. 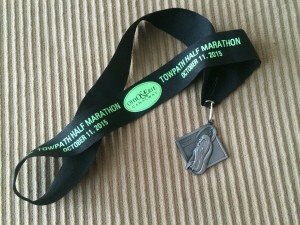 The medal is a custom medal featuring the event logo with a lanyard that identifies the event and race date. The medal is on the small side, but that is not my biggest concern with it. Somewhere along the way some medal manufacturers started telling event organizers that it is ok to attach a medal to a lanyard with these metal clips like you would find on a college key ring, instead of a sturdier metal ring. I am sure this is a cost savings, but can we please stop doing this? It does not look very nice and there is a constant fear that it will release, thus losing the medal that you worked so hard to earn. Ok, I am off of my soap box. The post-race experience is nice and has a very charming feel to it. There were plenty of Subway sandwiches and water cups for participants. They also provided a beer tent, but as I was driving home, I passed on this. Remember the problem that I mentioned about chafing? I stopped by the first aid tent to get some band-aids because, even after I was done running, my sweaty shirt was rubbing against my chest causing me discomfort. While we found the tent no problem, there was nobody staffing it. I hope they were tending to runners with more immediate needs than my own, but it is concerning when there is noone staffing an aid tent in the event someone does need aid. I did see the closed box of medical supplies, which I assumed held band-aids, but I would never help myself to such things, so after waiting a few minutes, I walked away without any assistance and did my best to hold my shirt out from my chest as I went in search of the shuttle buses (oh come on, we’ve all been there!). I set up my playlist to mimic the start of the playlist I used when I ran the Towpath 10k a few years earlier, which meant starting with Home by Phil Phillips and Muppet Show Theme. Doing so brought a smile to my face as I reflected on how far I have come in my Casual Running adventure since that first 10k. I can see why this race appeals to a specific sector of the Casual Running community. It is an affordable race that offers some variety to one’s racing calendar. 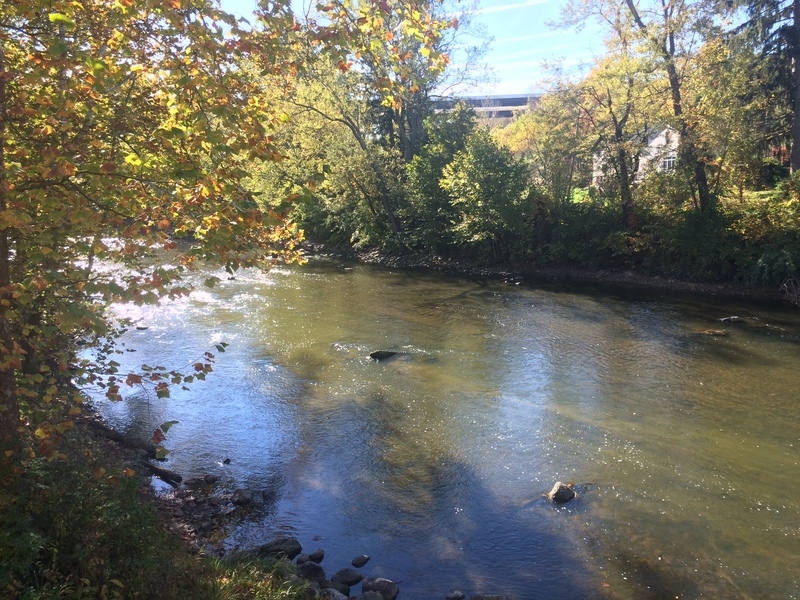 More importantly, it is set in the perfect time of year to enjoy the natural splendor of one of the true scenic gems of Northeast Ohio, and does so while supporting a good cause that will ensure that the community will enjoy this area for generations to come. Hi Christina – the park is open to the public so you can definitely feel free to stay and make a day out of it. Depending on the time of year some trails may be inaccessible due to weather, high water, or situations like that. Happy trails!